If you dedicate countless hours every week driving your kids to practices, meetings, and to hang out with friends, you probably don’t have a lot of spare time. In Aurora, CO, Dr.s Nicholas D’Amico and Matt Mauck can help you save some drive time by caring for the oral health of your entire family. Except for a few extraordinary cases, children don’t need to see a pediatric dentist. 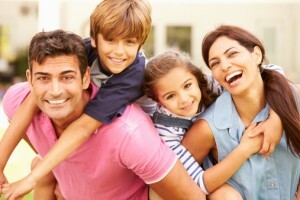 Your family dentists Dr.s D’Amico and Mauck are well equipped to meet the dental care needs of your whole family. We can even schedule a block of time in advance for your whole family to receive their checkups and cleanings. Whether you’re interested in pediatric or geriatric dental care, call D’Amico & Mauck to schedule an appointment today. Our dentists are highly trained and experienced in a variety of dental care services to meet the oral health needs of your whole family. Dr. D’Amico has more than 30 years of experience in the dental field. He has received extensive training in numerous dental specialties, and Denver’s 5280 magazine has named him a Top Dentist annually from 2008 – 2012 and a Top Aurora Dentist from 2005-2012. If you’re interested in making friends with some Denver Broncos, you may just run into one at our office that has served the Denver Broncos for nearly a decade. Dr. Mauck joined the practice in 2011, and since that time, he has contributed a great deal of knowledge and skill. Already given a fellow award from the Academy of General Dentistry. It’s no secret that oral health is important or that first impressions are important, but maybe you never thought about the link between the two. A healthy, radiant smile makes a great first impression no matter who you’re meeting. Recent studies show that employers are less likely to hire persons who have chipped, crooked, severely stained, or missing teeth. The foundation for a healthy, happy smile that makes great first impressions should begin in childhood. We all want the best for our children, and giving them top-notch preventive and general dental care puts them on the right track toward keeping their smile for life. At D’Amico and Mauck, we provide expert preventive and general care for your whole family. Preventive dentistry is a combination of regular dental exams and checkups, dental hygiene appointments and at home care. This is your first line of defense against any oral health concerns. General dentistry is the treatment of minor dental health issues like fillings, TMJ therapy, and periodontal care. Through a combination of outstanding preventive and general dentistry for the whole family, our practice hopes we never have to see you for complex dental procedures, but even the best efforts can fail. If they do, D’Amico & Mauck is here to help. Because our dentists have diversified fields of expertise, we are able to offer numerous dental services that may, traditionally, be referred to a specialist. Dr. D’Amico has completed two mini-residencies in dental implantology, studied reconstructive dentistry (crowns, inlays, onlays, etc. ), and has extensive training in anterior and posterior cosmetics. Dr. Mauck has extensive training in functional occlusion (bite alignment). This means he is an expert on TMJ diagnosis and treatment as well as being able to provide the best possible care to restore your bite to outstanding function. Whatever your dental needs, Dr.s D’Amico & Mauck can meet them. If you’re new to Aurora, are in need of a new dentist, or just want to find a practice that will care for your whole family in one convenient location, D’Amico & Mauck is right for you. Our dental care team is experienced, friendly, and make every dental visit a treat. If you have a question between appointments, our “ask the doctor” feature allows you to find out more before you arrive. Call to schedule an appointment in the Aurora, CO area including Denver Tech Center, Centennial, Englewood, Denver, and Parker.